The constant-velocity joint allows a rotating shaft to transmit power through a variable angle, at constant rotational speed, without any significant increases in friction or play. CV joints are commonly used at ends of the axle half-shafts on four wheel drive ATVs and side by side vehicles. These joints are very strong and low maintenance. The most common maintenance item is to check the condition of the rubber boot that covers the joint. If the boot is damaged, the molybdenum disulfide grease with which the joint is packed will be thrown out. The joint will then pick up dirt, water, and small rocks causing the joint to overheat and wear. The grease can also contaminate the brakes. In the worst case, the CV joint may dis-join causing the vehicle to stop moving or lock up, rendering the vehicle incapable of steering. Once you have discovered the CV boot is torn or otherwise damaged it is important not to operate the vehicle any further. While it may be tempting to go out hunting this weekend or haul a bunch of hay around the property – further use of the vehicle will contaminate the CV joint grease (water, dirt, sand etc) which will result in premature bearing failure. Do the job right, and do it once by remedying the situation as soon as it is noticed. If the vehicle is excessively dirty it is recommended that you clean the area around the boot. It is imperative to the longevity of your CV bearings that you do not get water or dirt inside the joint. If you must wash the vehicle you should wrap a plastic bag around the torn boot and seal the ends with tape or tie wraps. A clean work environment will limit the chances of contaminating and shortening the life of your CV joint. Having all the required tools and parts on hand is crucial to the success of any repair job. You should also obtain a quality service manual for the vehicle as it contains model specific information such as torque specifications, special procedures and safety concerns. A model specific repair manual is an essential tool that should not be overlooked. If an OEM CV boot kit is available this should be your first choice. These parts will cost more but are exact replacements and should provide the best fit. If you are comfortable using aftermarket parts or OEM parts are not readily available there are some good quality aftermarket kits on the market. These kits are usually a fraction of the cost of OEM but may require some modification to make the parts work. Make sure the kit you buy includes a new rubber boot, two clamps for each end of the boot and about 80 grams of grease. 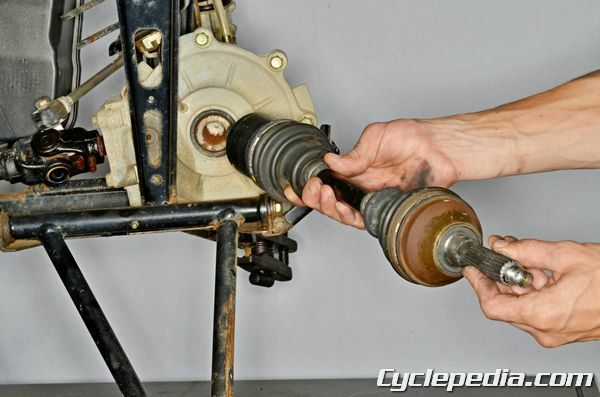 Remove the CV axle by gripping it firmly and pulling it straight out of the final drive or differential unit. The inboard end of the axle is secured by a circlip and may take a firm quick pull to free. Inspect the axle seals in the differential or final drive unit and be prepared to replace them if they are in poor condition. Inspect the axle shaft and splines for damage. Make sure the joints move smoothly. If the joints do not move smoothly the CV joints should be disassembled and inspected further or the axle should be replaced as a unit. 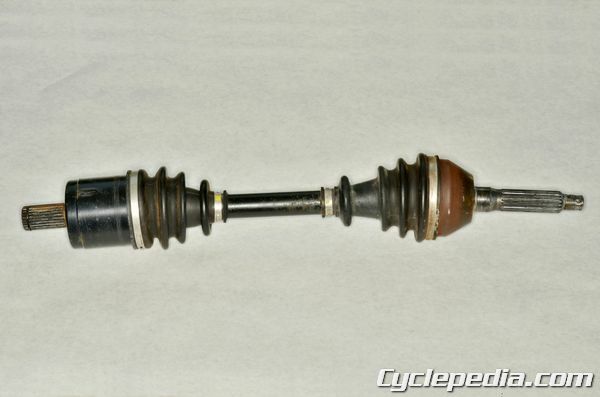 The inboard CV joint (long case) is a plunge joint that allows movement along the axis of the axle. This allows the axle to deal with changes of geometry created by the moving suspension. Make sure the inboard joint has smooth plunge movement and the outboard joint does not move in this way. Remove the boot clamps and free the boots from the joints are required. The plunge joint is often held in place by a large snap ring. 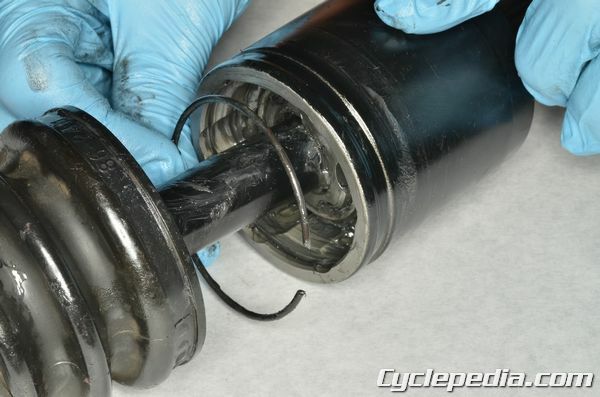 Remove this snap ring and free the plunge bearing from its outer race. Remove the snap ring to free the plunge bearing from the axle shaft if necessary. Drive the inner bearing race off the shaft if the inner and outer bearing races come off as a set. Only apply force against the inner bearing race to prevent damage to the bearing. Wipe out the CV and clean it out with contact cleaner to get rid of the remaining old grease. 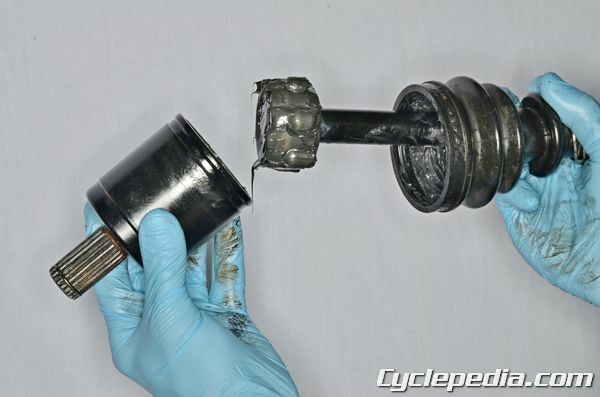 Also, remove any old grease from the axle shaft. 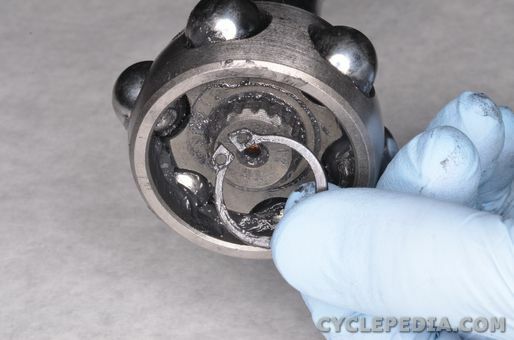 Inspect the CV components and replace them as needed. Allow the CV joint to air dry. 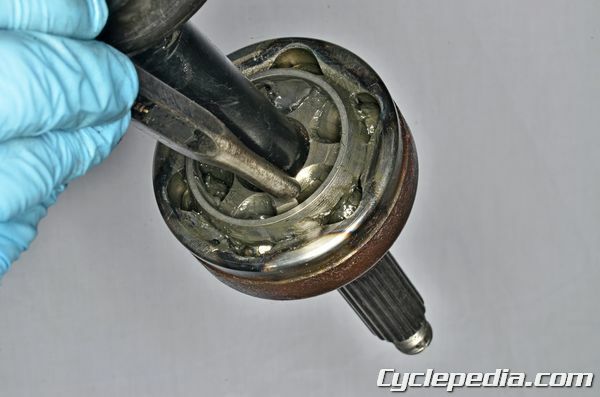 Thoroughly grease the CV bearings where they contact their races and axle shaft splines. Wipe away any excess grease on the edge of the housing where the boot will slide on. Assemble the CV axles with new snap rings. Secure the big end of the boot to the CV joint housing. Bleed any excess air from the small end of the boot and install the small end clamp. Apply grease to the axle seals and splines. Install the axle and previously removed components. Replacing a CV axle with a new or re-manufactured component is certainly the fastest way to get your customer back on their vehicle, but in some cases it can be cheaper too. OEM prices and parts availability for CV axles can vary dramatically from one brand to the next. Some quick research may show a re-manufactured or aftermarket axle makes more economic sense for than rebuilding the axle piece by piece in the service department.